The V900 high-speed sport airplane is the fastest prop-driven E-flite airplane yet! Right out of the box it can reach top speeds of 120+ MPH on 4S, and even 100+ MPH on 3S, without the need for upgrades or prop changes. 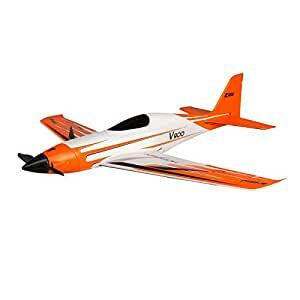 Itâs designed to whip heads by flying fast and looking good with slick aerodynamics, composite reinforced EPO construction and a vibrant trim scheme that stands out on the ground and in the air. If you have a need for speedâadrenalin pumping, righteous SPEEDâthen youâre going to love the E-flite V900 airplane. The factory-installed high-power brushless motor and 60-amp ESC deliver unlimited vertical performance and incredible top speeds up to 120+ MPH without the need for upgrades or modifications. The lightweight yet stiff and durable airframe is equipped with digital, metal-geared servos to offer precision and reliability youâll appreciate flight after flight. No glue is required for assembly, and you can be flying in just the time it takes to charge a battery. So whether youâre an intermediate pilot and this is your first high-speed airplane, or youâre an experienced speed addict, you can be in the air and flying FAST in almost no time at all. But the V900 airplane doesnât just fly fastâitâs well-behaved and slows down nicely for smooth approaches and landings, plus itâs capable of aerobatics including huge loops, rolls, knife edge and more.